Retail Market Reports leverages the experience of professionals with extensive careers in the food and drug industries to create comprehensive company and market-specific reports on publicly and privately held retailers across the country. Through in-depth research and analysis, we offer expert insight into a variety of industries, companies, market trends and competitive landscapes. Our reports, provided via instant online access, cover industries that include but are not limited to food, drug and mass merchandisers -- with the goal of facilitating the development of new sales leads and marketing initiatives. 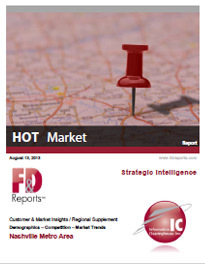 This detailed report provides an analysis of the current operational and competitive status of certain high-profile companies, including a review of historical development, market position, store count, distribution, area volume, and future trends. The product begins with an analysis of the future outlook for each company, with particular respect to its planned and potential expansion activity, marketing, pricing and promotional strategies, and current and prospective competition. A graphic comparison of market share, showing its position among food retailers in selected metro areas, is followed by a review of store operations, products and/or formats and an analysis of its distribution and manufacturing operations. This comprehensive report examines retail grocery activity within a highly active metropolitan area, analyzing demographics, market share, local trends, competition and future outlook. The analysis begins with the area's future outlook, addressing how competitive activity will likely evolve and acknowledging new or potential entrants and trends and supported by market share comparison charts. 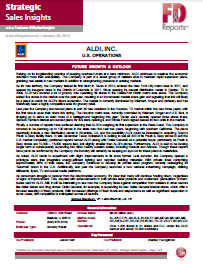 The report then presents a list of the top food retailers, number of stores in operation and market share, followed by a more in-depth review of current and future financial health, store growth, M&A activity, and marketing initiatives for each of the area's major grocery retailers. Where relevant, metro areas will include a brief description of distribution activity. After an assessment of cross-channel competition, including mass merchandisers and convenience stores, the report concludes with a look at key factors in the area's demography, including population, ethnicity, income, unemployment, housing and foreclosures.